You guys, Shia LaBeouf seriously might not be famous anymore. Well, he's famous enough for us to write about him not being famous anymore, but he doesn't want to be famous to the point that he's dropped out of his next movie. Shia LaBeouf has dropped Rock The Kasbah, a Barry Levinson-directed comedy LaBeouf signed on for in February. Rock the Kasbah is set to star Bill Murray, Kate Hudson, Danny McBride, Bruce Willis, and Zooey Deschanel. Or, famous people. See, this is how we know LaBeouf means business with his not being famous plan. Leaving Rock the Kasbah means that LaBeouf currently has no movies in the works other than Fury, in which he costars with Brad Pitt, a film that has already been shot and is in post-production. In addition, LaBeouf hasn't tweeted since Feb. 17 and we all know how much he enjoys that. Is this really the end of acting for Shia LaBeouf? After Fury comes out could it really be the last we hear of him? Are we comfortable growing old and only vaguely remembering LaBeouf as that kid from Even Stevens who went sort of crazy? Actually, I think that's the story he's getting no matter what. But what about Shia LaBeouf in the news? 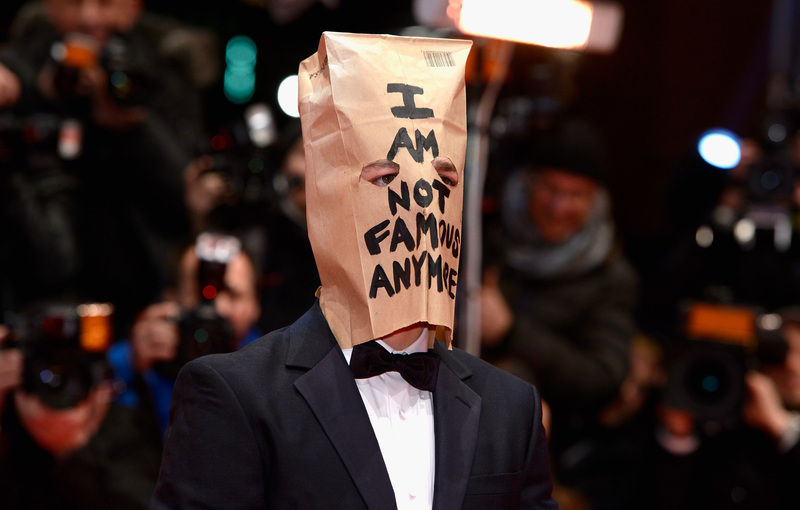 No more LaBeouf showing up at premieres with paper bags over his head? No more performance art exhibits where he also has a paper bag over his head? No more bar fights? No more tweets?! Has Shia LaBeouf really gone radio silent? None of these questions have any immediate answers, so I guess you can just look forward to Rock the Kasbah...? Sorry, I'm just a little shaken at the thought that this may very well be my last piece of Shia LaBeouf news. If this is what you wanted, LaBeouf, then well done, sir. I wish you well. For those interested, Rock the Kasbah is unfortunately not a Clash biopic starring Bill Murray as Joe Strummer. Instead it, follows a rock manager who takes his only client on a USO tour of Afghanistan. While there, he "discovers a young girl with an extraordinary voice and manages her through Afghanistan's version of American Idol, the wildly popular Afghan Star." Sounds... severely lacking in LaBeouf.